Some ideas translate better in America than they do in Germany. The only thing I had on my agenda today, aside from taking my son to a follow-up appointment with his doctor and a lovely little nap, was a pedicure. I had a bad pedicure experience right after Lennon was born, which incidentally was the first pedicure I allowed Berlin to give me. The woman jabbed at my cuticles with her stainless steel instrument, all the while holding my delicate toes between her sharp, pointy nails. She didn’t use a base coat. I had to request and second layer of polish. I went back to performing my own pedicures, thank you very much. It’s so time consuming to do, however, and now in a new neighborhood, I thought I’d give Berlin a second chance with my feet and myself a decadent gift for the 40 Days of Birthday. Just like at “L.A. Nails”—with their big sign that says “Hello and Thank You!”—the staff at “American Nails” does not speak English. No bother, my German would accommodate this transaction. Once the details of my request were processed, I came to find out that another customer was coming at 5:00pm, and with it being 4:45pm, a pedicure would not be possible. This was decidedly un-American. I have never been turned away from a nail salon in the U.S. for lack of time—those ladies squeeze you in, even if others have to wait. Never mind. I knew of a hair salon just down the block that had a sandwich board advertisement out front boasting of beautiful nails. My hope was that the sign correlated with their services. The woman inside spoke English and I was able to make my wishes clear much quicker than at the last joint, but to no avail, as their cosmetologist was out sick. I almost gave up and headed home but remembered that the local mall had a nail salon: Paradise Nails! This place had to be doing something right. They had three ladies working and I was seated immediately in a new looking, brightly colored massage chair, my feet soaking in sudsy water. I already felt better. This was the pedicure of my homeland. As my pedicurist worked on my toes, I realized how disorienting it was to have to decipher between two foreign languages: German, which I’m on thin ice with, and another, completely unknown-to-me tongue. It took a great deal of concentration to determine when she had stopped talking to her colleagues and had begun talking to me. Luckily, she rarely engaged my in conversation. I felt self-conscious when, amongst the foreign sounds of her conversation to which I'd been eavesdopping, the word “iPhone” rang clear. I’d been secretly taking photos with mine. I was disappointed that the calf massage would cost extra and therefore have to be forsaken. Her polish job was okay, but I’ve had better. In the end, without all the perks, it was still more expensive than pedicures in America. On the up side, the "Jet Dryer" toenail dryer was fast and had a well-designed logo, something the salon itself could have taken a lesson from, if I’m to be boldly honest. 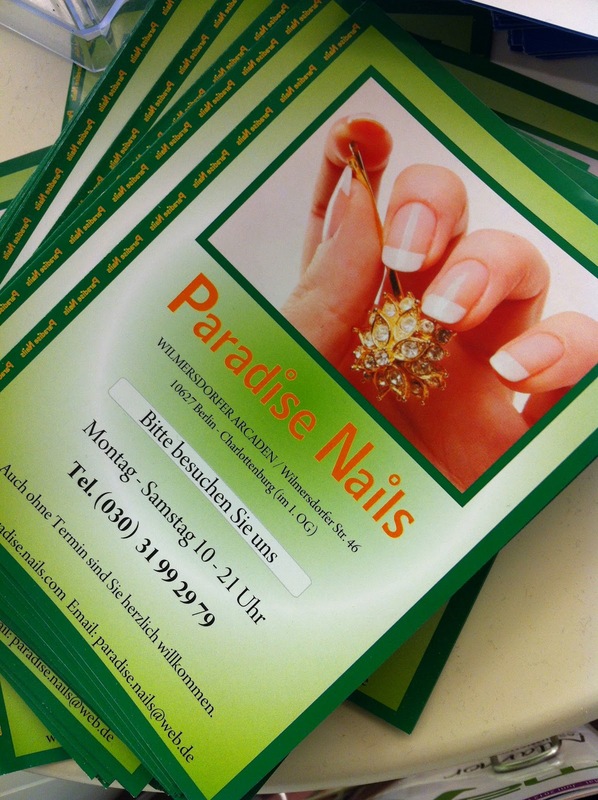 Paradise was not experienced at its namesake nail salon. Not the worst pedicure ever, but my take-away from the day is, when in Berlin, do your own toes. Post Script--Just as my nails finished drying, an older employee entered the salon, went to the reception desk, and put on Michael Jackson's "Beat It" so that it played loudly through the speakers, apropos of nothing. I might be back.